In 1982, a local discount house, known as Dahlkemper's at the time, recognized the need to support the use of the TI-99/4A Home Computer and, of course, the sales thereof. They offered their display rooms as a meeting place for TI users. Hence, the Erie 99'ers User Group was born. 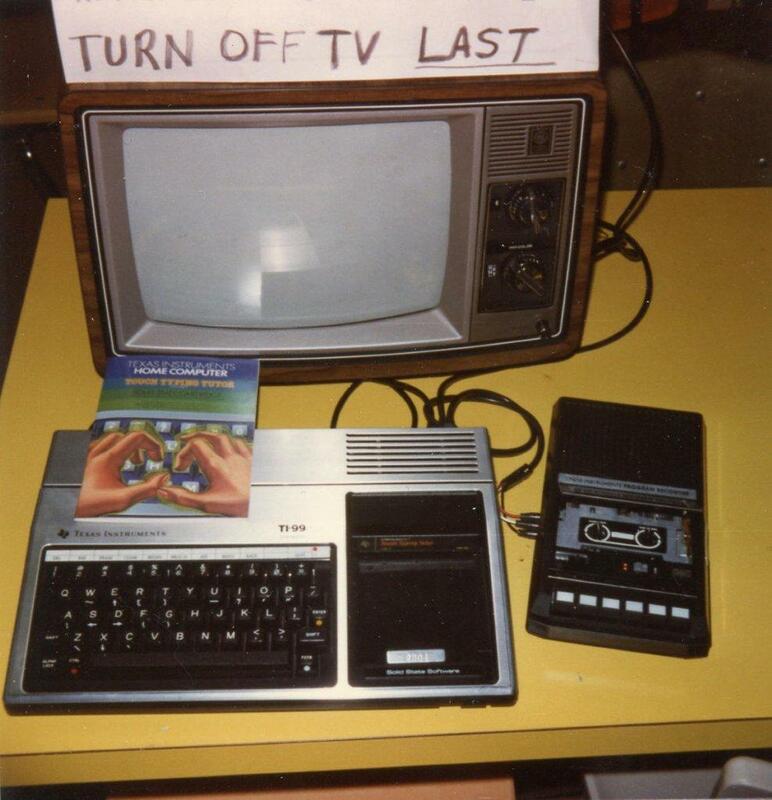 When production of the TI-99/4A ceased in 1983, the User Group continued to meet at Dahlkemper's until November 1984. By that time, third-party computer and software developers had increased their efforts to manufacture accessories and expansions utilizing the TI-99/4A platform. One example of this expansion of equipment for the TI platform was the marketing of the Geneve 9640 cards for the PHP1200 Expansion System and utilized the IBM keyboard and RGB monitors vastly expanding the utility and capacity of the computer system. When coupled with the extremely efficient TI language used in the TI-99/4A and the PHP1200 Expansion System, the Geneve 9640 offered the TI community tremendous possibilities. But we all know that this so-called efficiency of language gave way to the more grandiose memory capacity of the PC and Apple platforms. So, instead of dying a quick death, TI user groups continued to flourish worldwide. My collection of User Group Newsletters found in my basement revealed over 70 Texas Instruments user groups just in the US alone in the 1980's! There were many more that either didn't publish newsletters or didn't exchange newsletters with us. The Erie 99'ers User Group was one of them. In December of 1984, the Erie 99'ers entered into an arrangement whereby the group could meet in the offices of a local employment agency in exchange for providing and maintaining the TI computer systems installed in the agency's offices. The agency had use of the TI-99/4A, the PHP1200 Expansion Systems, and printers to keep track of their clients and handle the bookkeeping chores. This was a sweetheart deal that provided an inexpensive and convenient place to hang out with computers to use during the meetings! Then "progress" struck again. The agency needed to communicate with others outside its premises. In so doing, they had to transfer their data to different platforms compatible with those in other offices to say nothing of the need to use the internet. Obviously, this meant moving to PC or Apple platforms. The Erie 99'ers had no choice but to begin meeting in members' homes. However, it wasn't long before someone inquired about the possibility of using my Computer Room full of TI-99/4A computers as a meeting place. (See Figures 1 and 2.) Hence, I gained permission of the School District to use my Computer Lab at night once a month. We did have to provide a certificate of liability insurance each year but otherwise, it would cost us nothing to meet there. Now we could hold computer classes and demonstrations using the computers and projection screens already installed in the room. A few of the early members of the Club included Ross Caruana, Chet Magee, Sal Parco, Donna Baird, Ed Waskiewicz, Norb Sitter, Pete Wingfelder, Rod Kerr, Joe Derosa, Rob Mineo, and Jim Kwiatkowski. Jim was the President when the Group first met at the employment agency and began publishing the "Erie Ninety Niner User Group Newsletter." His first computer was the TI-99/4 which he bought in 1979. He later purchased the TI-99/4A when it first became available late in 1981. Jim was among the first in the area to write programs for his many applications. The Erie 99'ers became a major player among user groups in the Erie area in the 1980's. 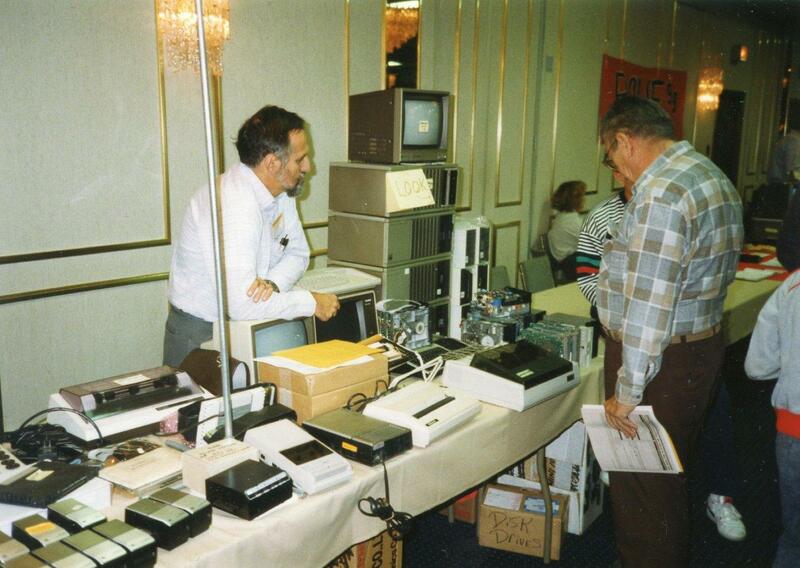 The User Group held periodic computer displays in the corridors of Millcreek Mall as a means of attracting new members. (See Figure 3.) 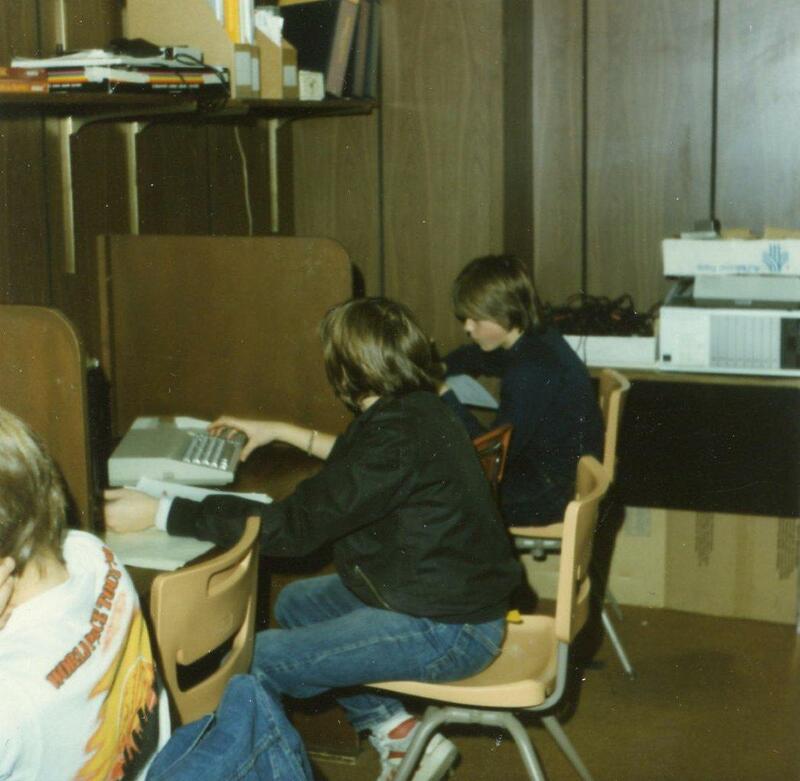 The Group also helped organize the region's consortium of user groups (NUAGE) along with groups representing Commodore/Amiga, Atari/ST, Apple/MAC/Franklin, Radio Shack/Tandy/MS-DOS , and Texas Instruments. NUAGE began holding computer shows at venues such as the National Guard Armory, Gannon University Auditorium (See Figure 4), Mercyhurst Colleege Recreation Complex, and Rainbow Gardens Ballroom (See Figure 5). NUAGE contacted a national show organizer who agreed to hold periodic computer shows in Erie. 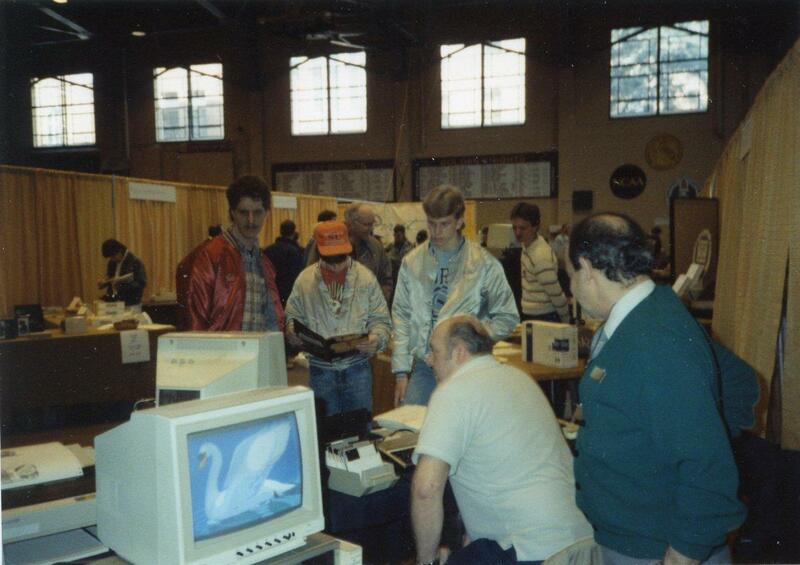 The show, known as ComputeErie, was held in the huge Tullio Arena and attracted thousands of people who visited the many booths set up by user groups and vendors. These shows continued well into the 1990's. By the time I retired in 1993, our membership dropped to the point that the Group ceased to exist. 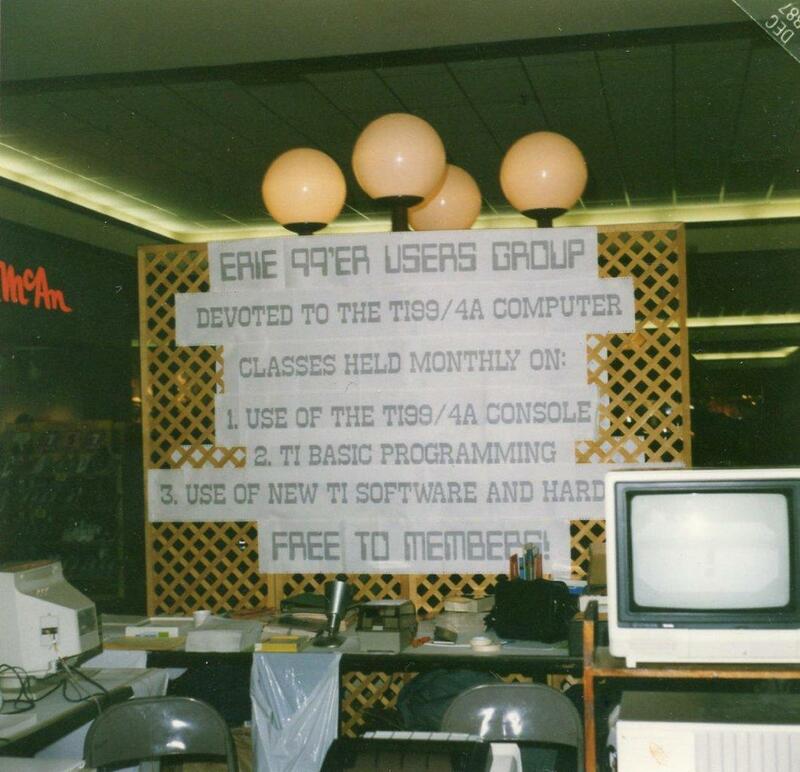 It was then that the Erie 99'ers merged with the Computer Users of Erie. Today, I know of no one in the Erie area actively involved with the TI-99/4A. For the past 17 years, the equipment remained largely unused in my basement except for the occasional use by my grandkids whenever they visit us from New England. Two of them took a console and some software back home last summer. Who knows what will transpire in their fertile minds as they grow into adulthood! For me, it is time to downsize and........to be continued soon.